Known as the Queen of Gems, pearls have been coveted for centuries. Elegant, timeless, and mysterious, pearls come in a range of sizes, shapes and colors. Besides being the birthstone for June, the pearl is also frequently gifted on the 1st, 3rd, 12th, and 30th wedding anniversaries. Our overview will help you understand the basics to choose pearls just right for you. A pearl is produced by a living organism, which makes it an organic gem. Pearls are composed of calcium carbonate (mainly aragonite or a mixture of aragonite and calcite) which has been deposited in concentric layers and grows inside saltwater and freshwater mollusks. A mollusk is a soft-bodied marine animal with no backbone. Most pearl-bearing mollusks are bivalves, which mean they have two-part shells. Natural Pearls: Pearls formed without human intervention when a foreign object gets inside a mollusk and irritates the soft tissue, or mantle that lines its shell. The mollusk tries to reduce the effects of the irritant by coating it with layers of smooth nacre. Nacre is composed primarily of aragonite, which is crystalized form of calcium carbonate, a chemical compound of calcium, carbon, and oxygen. Nacre also contains conchiolin, a binding agent similar to material found in human hair and fingernails. 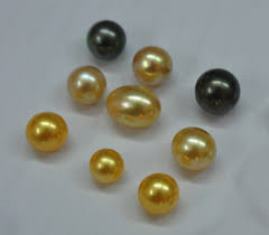 The finest quality natural pearls have been highly values as gemstones for many centuries. Because of this, pearl has become a metaphor for something rare, fine, admirable and valuable. Cultured Pearls: Produced with the help of human intervention. A piece of mantle tissue (typically used for freshwater pearls) or with a mother-of-pearl shell bead (typical of saltwater pearls) are implanted into the host mollusk. Just like with a natural pearl, the mollusk secretes nacre in response to the irritant. Nacre ultimately covers the irritant. Cultured pearls are grown in pearl farms where the mollusks can be carefully monitored, protected and eventually harvested. It has been estimated that there are over 100,000 different species of mollusks in the world. However, only a few dozen of these species produce cultured pearls. Cultured pearls are classified by the species of mollusks that produce them. Akoya Cultured Pearls: Akoya cultured pearls are most commonly produced in Japan or China on saltwater pearl farms, and the mollusks that produce them are called the Pinctada fucata oyster. In Japanese, the common name for the oyster is akoya, so the cultured pearls are also called akoyas. The Akoya pearls usually range from 2mm to 10mm with an average size of 6mm to 7mm. Because akoya cultured pearls are fairly consistent in size and shape, they are ideal for well-matched strands. Freshwater Cultured Pearls: The mollusks that produce freshwater cultured pearls are called mussels. The main produces is the Hyriopsis cumingi and these pearls are produced mainly in lakes, ponds, and rivers in China. Chinese freshwater pearls typically range from 2mm to 13mm with sizes found as large as 20mm. They come in many shapes and colors including white, orange, and purple. They are also commonly dyed in a multitude of colors. Tahitian Cultured Pearls: Tahitian cultured pearls are grown in the Pinctada margaritifera oyster, the only oyster that regularly produces the unusual color that characterize Tahitian cultured pearls. 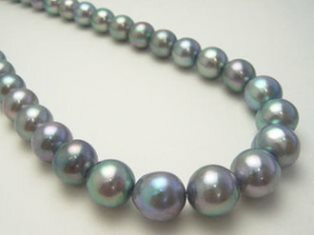 Described in the trade with names like peacock, aubergine, and pistachio, these exotic pearls are native to the islands of French Polynesia and the Cook Islands. They range in size from 8mm to 17mm, with most falling between 9mm and 11mm. Well-matched strands of large, lustrous Tahitian pearls with their unusual colors command d high prices. South Sea Cultured Pearls: South Sea cultured pearls are produced mainly in Australia, Indonesia, and the Philippines in the Pinctada maxima oyster. South Sea cultured pearls range from 8mm to 18mm with most falling between 10mm and 15mm. The two varieties of Pinctada maxima, gold-lipped and silver-lipped, account for the characteristic color. The silver-lipped oyster produces pearls that are mostly white to silver, occasionally with pink, blue or green overtones. The gold-lipped oyster produces mostly yellow to orangy yellow pearls referred to as golden in the trade. South Sea cultured pearls typically have a soft, satiny luster, rather than a mirror-like surface often seen on the finest akoya pearls. Pearl History and Lore: People across the globe have prized and harvested pearls for at least 6,000 years. Ancients from the Middle East believed that pearls were teardrops from heaven. 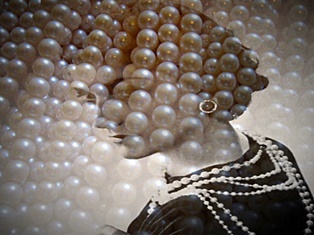 In ancient times, the expense of perfect pearls gave rise to a curious spell for increasing wealth. The caster would select a particularly fine pearl, infuse it with the desire for riches, and then throw it away into a rubbish heap. The idea behind this sympathetic magic practice was that someone who could throw away pearls was rich indeed. Pearls are known for their beauty, purity and luster and these are associated with the planet Moon. In the Indian mythology, it had been used with great advantage for general prosperity and good luck. It gives confidence to the wearer in love and life. It can be used by students for greater concentration, young couples for marital harmony, older persons for better health and to relieve tensions. In many cultures, pearls symbolize purity, humility, and innocence which is why it’s tradition for a bride to wear pearls on her wedding day. History of Pearls: Pearls were used in jewelry at least as far back as ancient Greece, and until the 20th century pearls were one of the most valued gems, if not the most valuable, in many cultures. The rules of the Byzantine Empire dictated that only the emperor was allowed to wear pearls, and other societies had rules about who could and could not wear these little treasures. The sixteenth century in England was known as the Pearl Age, reflecting the prestige carried by pearls at that time. Pearls became more accessible in the early 1900s once people in Asia discovered how to create cultured pearls. By carefully placing a small nucleus into a living oyster, pearl forms around the nucleus, allowing pearls to be created in oyster farms. Every pearl’s value is determined by seven properties called value factors. Each value factor is important by itself, but it’s their relationship to each other that determines a pearl’s value. Shape: Round pearls are the most difficult to culture and occur least frequently in most culture pearl types so therefore, round is the rarest shape. If all other value factors are equal, the round pearl, as a rule, will be the most valuable. Color: While many prefer the classic white pearl, pearls come in every color of the rainbow. Naturally colored pearls like black Tahitian pearls or Golden South Sea pearls are graded on their color’s depth and saturation- the more strongly colored pearls will be more rare and valuable. Certain overtones or exotic body colors command premium pricing at auctions. Luster: Luster in pearls is caused by light traveling through translucent layers of nacre and reflecting back to the eye. The nacre’s thickness, its degree of translucence and the arrangement of the overlapping nacre layers all contribute to luster. Surface Quality: If surface characteristics are numerous or severe, they can affect the durability of the pearl and depress its value. On the other hand, surface characteristics have less effect of the pearl’s beauty and value if they are few in number, or if they are minor enough to be hidden by a drill-hole or mounting. Nacre Quality: For nacre to have a high-quality appearance, it must be highly translucent. High translucence permits better penetration, refraction, and reflection of light. Those are the ingredients of luster. Matching: Matching pearls for pairs, sets, and strands requires an extremely large quantity of pearls and a great deal of labor, time, and skill. Matching is a progressive sorting process to achieve the highest degree of uniformity possible. With a little care, pearls can last a lifetime – or two or three. In many families, it’s traditional to pass pearls from one generation to the next. Although pearls are not the most durable of all gems, they can retain their original beauty for generations if they are properly cared for. Pearls are soft and be easily scratched or abraded. They should be protected from contact with other metal or harder gems. Store pearls in a cloth pouch or wrapped in a soft cloth. Pearls can chip or break if they’re treated carelessly. They might chip or break if they’re not handled gently. As organic gems, pearls are part water. Maintaining that moisture is one key to their stability. Heat alone or hear from intense light can dry out pearls and lead to discoloration. Keep pearls away from heat and excessive dryness. Another key to maintaining pearls lies in everyday wear and care. Many chemicals and all acids attack pearls. Perfume, cosmetics, hair products and acids in perspiration can damage nacre. Women should put on cultured pearls only after they’ve applied cosmetics and hair products. To help maintain their luster, wipe pearls with a soft cloth after wearing. Occasionally using a damp cloth helps them retain moisture as well. Pearls should be thoroughly cleaned periodically, especially if they’re worn often. Never clean them with an ultrasonic cleaner or using by using ammonia. Detergents and other chemicals can dull nacre and cause surface pitting. If worn frequently, it’s a good idea to restring them about once a year or when the silk string shows wear to help prevent losing or damaging pearls. Whether natural or cultured, pearls have always had a magnetic allure. They have versatility and timeless appeal. The lore and history of pearls give them romance and allure. Perhaps, it’s their soft, magical quality that makes the June birthstone so appealing.